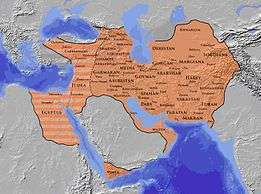 Adurbadagan, known as Āturpātakān in Middle Persian, Atropatene in Greek, and Atrpatakan in Armenian, was a Sasanian province in northern Iran which almost corresponded to the present day Iranian Azerbaijan. The capital of the province was Ganzak. In 224, Adurbadagan submitted with little resistance to Ardashir I (r. 224–242) once he had defeated and killed Artabanus at the Battle of Hormizdegan. In 241/2, during the reign of his son and successor Shapur I (r. 240-270), the latter had to make a expedition to the province due to unrest. After that, the province became completely subdued. In the spring of 589, Adurbadagan was invaded by the Byzantine ally Guaram I of Iberia. However, when he discovered that the Sasanian army chief (spahbed) Bahram Chobin had defeated a massive Turkic army in Khorasan, and was now marching to Adurbadagan, he quickly withdrew. The following year, Bahram Chobin, after having been disgraced by king Hormizd IV, rebelled against him, and quickly managed to take control over the whole Sasanian Empire. In August 591, the Battle of Blarathon took place near Ganzak, between Khosrau II's supporters and the rebel forces of Bahram Chobin. However, not long after the battle, Khosrau's maternal uncle Vistahm rebelled (precise date unknown, 590/1–596 or 594/5–600), and managed to gain control of some parts of Adurbadagan. He was, however, defeated by Khosrau II and the Sasanian general Smbat IV Bagratuni. During the Byzantine–Sassanid War of 602–28, Adurbadagan was invaded by the Byzantine emperor Heraclius, who had Ganzak sacked. Adurbadagan, including the rest of Iran, was briefly under the control of the former Sasanian spahbed Shahrbaraz. In 651, the Arabs invaded Adurbadagan, which was the domain of the Ispahbudhan brothers Isfandyadh and Bahram. Isfandyadh made a stand against the Arabs, where a battle was fought. He was, however, defeated and captured by the Arabs. While Isfandyadh was in captivity, he told the Arab general Bukayr ibn Abdallah, that if he sought to conquer Adurbadagan easily and peacefully, he should make peace with him. According to Bal'ami, Isfandyadh is known to have said that: "If you [were to] kill me all of Adurbadagan [will] rise in avenging my blood, and will wage war against you." The Arab general accepted Isfandyadh's advice and made peace with him. However, Bahram, the brother of Isfandyadh, refused to submit to the Arab forces and kept resisting them. Although he was quickly defeated by the Arabs, and was forced to flee from Adurbadagan. Adurbadagan thus came under Arab suzerainty. The population of the province spoke Middle Persian, Adhari (including its dialect Tati) and Median. ↑ Boyce 2000, pp. 289-290. ↑ Schippmann 1987, pp. 221-224. ↑ Greatrex & Lieu 2002, p. 171. ↑ Shahbazi 1989, pp. 180-182. ↑ Pourshariati 2008, pp. 132-133, 135. 1 2 Pourshariati 2008, p. 278. ↑ Pourshariati 2008, p. 279. ↑ Daryaee 2008, p. 101. Boyce, Mary (2000). "GANZAK". Encyclopaedia Iranica, Vol. X, Fasc. 3. pp. 289–290. Chaumont, M. L. (1987). "ATROPATES". Encyclopaedia Iranica, Vol. III, Fasc. 1. pp. 17–18. de Planhol, X. (1987). 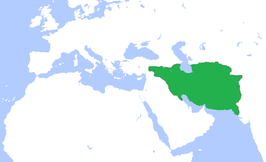 "AZERBAIJAN i. Geography". Encyclopaedia Iranica, Vol. III, Fasc. 2. pp. 205–215. Schippmann, K. (1987). "AZERBAIJAN iii. Pre-Islamic History". Encyclopaedia Iranica, Vol. III, Fasc. 2. pp. 221–224. Shapur Shahbazi, A. (1989). "BESṬĀM O BENDŌY". Encyclopaedia Iranica, Vol. IV, Fasc. 2. pp. 180–182. Retrieved 13 August 2013. Greatrex, Geoffrey; Lieu, Samuel N. C. (2002). The Roman Eastern Frontier and the Persian Wars (Part II, 363–630 AD). New York, New York and London, United Kingdom: Routledge (Taylor & Francis). ISBN 0-415-14687-9. Pourshariati, Parvaneh (2008). Decline and Fall of the Sasanian Empire: The Sasanian-Parthian Confederacy and the Arab Conquest of Iran. London and New York: I.B. Tauris. ISBN 978-1-84511-645-3. This article is issued from Wikipedia - version of the 2/3/2016. The text is available under the Creative Commons Attribution/Share Alike but additional terms may apply for the media files.